As a business owner or independent worker you have a lot on your plate. It doesn’t matter whether you work on your own or have other staff to think about. Either way there is a lot to manage. There are clients, finances, production work and more. As you work to keep all of the plates spinning, you inevitably find one or two wobbling. Then you go into firefighting mode and run to their rescue. So those other projects or products you’ve been thinking about for ages...you know, the one that is going to be the ‘next big thing’...don’t stand a chance. This is because the items that almost always get left out are: planning for the future and marketing. I know how you feel. I was in that position. I had several businesses, my ‘next big thing’ projects, but was struggling to achieve anything significant with them. I’ll share them with you to give you an idea of where I was. There are several facets to my business. RMLalchan, the web and graphic design side that you may know me from originally: building sites, branding, designing logos, annual reports, e-newsletters and web consultancy, amongst other things. Creatives Hub, founded in 2012 to inspire creatives to get stuff done and make a living out of their creativity. We’ve run quarterly events, monthly accountability groups, podcasts (we have three channels and have released over 70 episodes) and the blog under this brand. The Clarity Programme - in collaboration with fellow designer Zoë Chan, we developed The Clarity Programme and we launched Clarity for Creatives, our first implementation of that programme, to help creatives - initially - get clear on their vision, values, brand personality and target audience. The problem with all this is we end up sacrificing quality. Something has to give. If we focus on too many things simultaneously, none of them receives the proper focus. So what am I doing about it? There are a lot of similarities in the three areas I mentioned above: RMLalchan Web & Graphic Design, Creatives Hub and The Clarity Programme. Since all three have a similar mission as stated above, we are consolidating under RMLalchan to provide the most focused and intentional resources for small businesses to get clarity on their business and marketing messages and goals. We will have all of our best work here and stay focused on helping you achieve clarity in your own business. I’m taking my own advice and I believe it will help you too! It’s a common saying that plumbers have the worst plumbing in their own homes. Likewise, it can be the case that with the task you provide for others, you’re so focused on providing it for them, you don’t make the time to provide it for yourself. I spend a lot of my time helping give clarity to others. I’ve not spent enough time receiving this support for myself. My first area of advice is to make sure you have someone external to your company who you trust and can regularly input to your business. I employ a business coach, which is a big investment but worth every penny as she helps me ‘see the wood from the trees’ and has been a huge inspiration and motivator to take my ideas and make them a reality. I can be accountable to her, knowing she will want to know how I’ve spent my time. Accountability can be a key issue for business owners as not everyone is good at managing their own time. There is often an assumption that running your own business or running a team means you are good at time management. This is not always the case. Having someone who has been there and done it, and can ask those tough questions of you without accepting paltry answers, can be the difference between your business succeeding or failing. I mentioned before about carrying out a task only when you feel driven to do so. This will only get you so far. Unless you can implement a daily routine –as many successful business owners have– you will always be lurching from one thing to another, never fully achieving your real aims. The area that piques your interest on one particular day may not do so on another, yet its requirements still remain the same. Getting into a routine of spending even a small amount of time every day on future planning and marketing will help you to achieve more than you thought possible. What you should do in that time, we’ll cover in a future post. Talking of finding a small amount of time per day…one of the key problems with firefighters (metaphorically speaking, not literally!) is the propensity to bring up that old excuse of ‘I don’t have enough time’. Yes, you do. The issue here is often one of not being able to prioritise and break tasks down. There can often be a false assumption that you need to find big blocks of time: a day here, half a day there, or even a dream of booking a week off to focus on your business planning. So often, this is just that: a dream. Client work and the day to day demands of running your business will get in the way. However, finding and dedicating just 30 minutes every day will work more wonders than dreaming of finding a full day or a week. At RMLalchan our focus is on helping your business find clarity, define your strategy and drive your business forward with goal-achieving actions. You will then be in a stronger position to have your branding developed, your website built or your logo designed, whether that’s done by us or anyone else. It is a process that will take time, but over the coming months we will be taking our own medicine and would love you to follow along with us on our journey. So follow us on Twitter and LinkedIn and sign up to our newsletter for the latest tips on how you can get clarity for yourself. 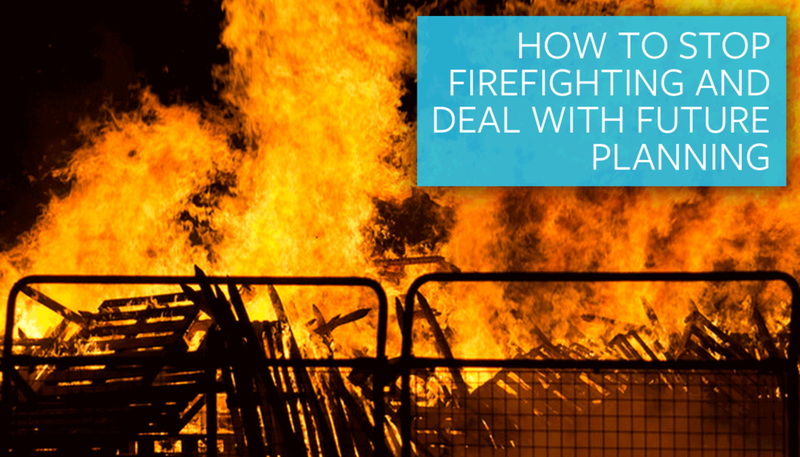 It’s time to stop firefighting and making excuses, so you can finally deal seriously with growing your business in the way you’ve dreamed of.